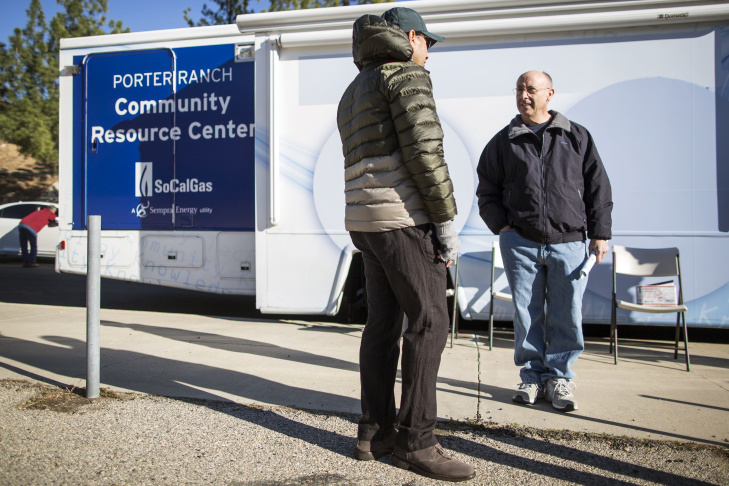 SoCal Gas has set up a community resource center on Tampa Avenue near the entrance to their Aliso Canyon Storage Facility near Porter Ranch. Patricia Oliver is an attorney with the R. Rex Parris Law Firm. 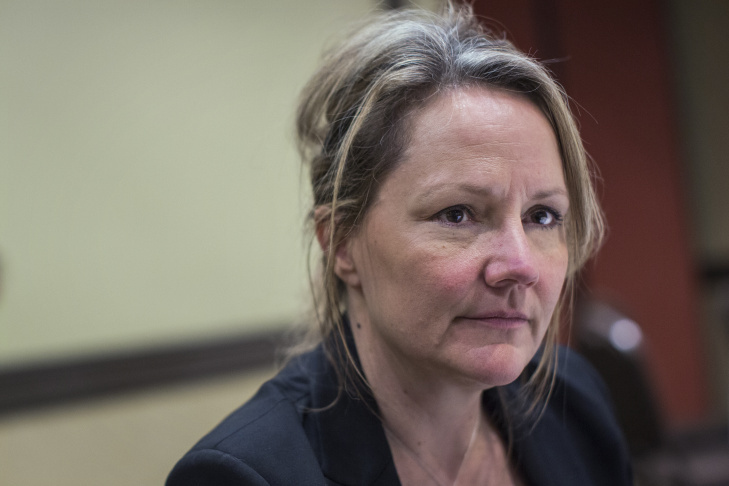 In November, the firm sent a 54-page letter to state officials demanding an emergency order requiring SoCal Gas to stop all injections in the oilfield. 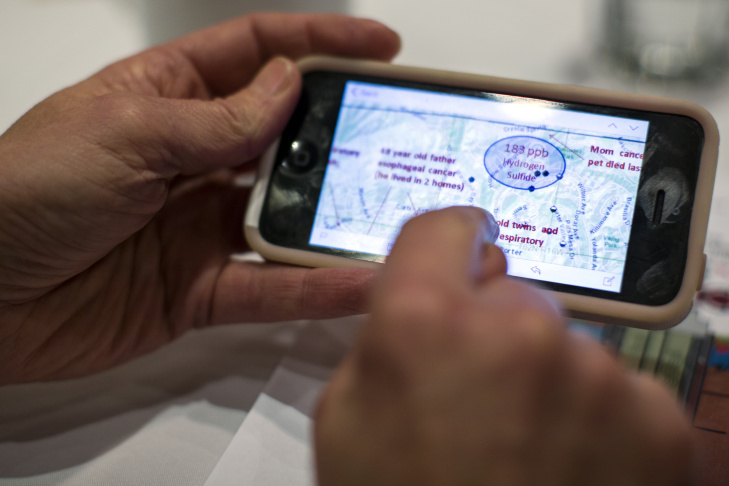 Patricia Oliver, an attorney with the R. Rex Parris Law Firm, looks at a map of active and inactive wells throughout SoCal Gas' natural gas storage facility near Porter Ranch. Patricia Oliver, an attorney with the R. Rex Parris Law Firm, explains a diagram of the ruptured well near Porter Ranch that has been leaking since Oct. 23, 2015. 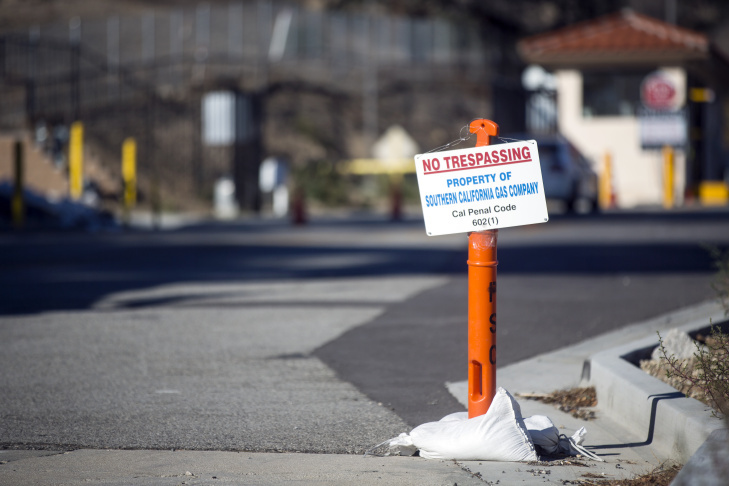 Southern California Gas Co. estimates it could be months before it can plug a natural gas leak the smell of which has driven thousands of Porter Ranch residents to relocate away from their San Fernando Valley neighborhood. But as more people leave, school campuses close and lawsuits mount, some question what the long term fallout from the leak will be. 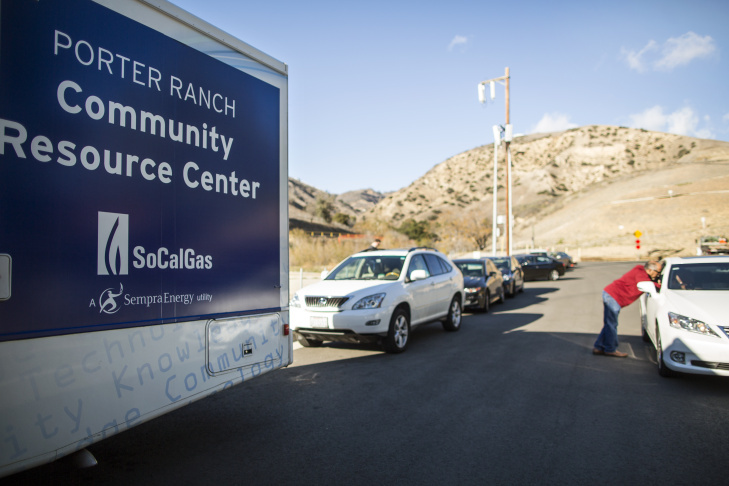 On a recent week night, Southern California Gas Company had just opened a new storefront office in the Porter Ranch Town Center. Every desk and chair inside the office was occupied with SoCal Gas employees and residents talking over home relocation and reimbursements of air purifiers with carbon filters. Outside a dozen more people were waiting in line to get inside. One of them was Jack Mertell. His home is about a mile from the leaking well, but he said he'd never smelled a foul odor and wasn't overly concerned when news of the leak broke in late October. But, now, two months later, he's concerned. "I'm real dizzy in the mornings and have headaches," he said. "I started getting them about December 1." That was something new for him. So he came to the gas company office, "Just to get housing. I want to get the heck out of here." Across the street from the Town Center is Shepherd of the Hills — a local mega church. On this night, it filled every one of its 1,500 seats with Porter Ranch residents who had come to hear a group of attorneys discuss a series of lawsuits they have filed on behalf of the residents against the Gas Company. Pastor Dudley Rutherford offered the gigantic sanctuary as the venue. He opened the meeting with a prayer and described his own problems with the leak. "I don't like waking up every night with headaches, major headaches, so I've relocated and have yet to be reimbursed but hope to be, amen amen," he said. Porter Ranch resident Nicole Abraham, in the red shirt, waits her turn to ask attorneys a question about the massive gas leak at the nearby Aliso Canyon underground gas storage field. The gathering was essentially a call to sign up with the lawyers from four different firms who have partnered up to sue the gas company. They said SoCal Gas could face judgments worth billions of dollars. They have filed a class action lawsuit to get the gas storage field shut down and address community-wide problems. They are also filing individual lawsuits to cover the heath and property losses unique to each family — possibly thousands of families by the time this all shakes out. "If you own property in the community, your property values are going to be affected," attorney R. Rex Parris told the gathered residents. "There is nothing anybody can do about that. You will suffer a loss if you do not file a lawsuit to get compensated for it." Parris and the other lawyers and a collection of doctors (a neurologist, a psychologist, a pediatrician, a geriatric doctor and a veterinarian) spent the next two hours instructing the audience about which symptoms are associated with exposure to the worst chemicals that might come from the gas leak and how to prepare their own information for the lawyers. Part of the message was meant to get the audience to distrust and question what the gas company and county and state authorities have been telling them about the leak. 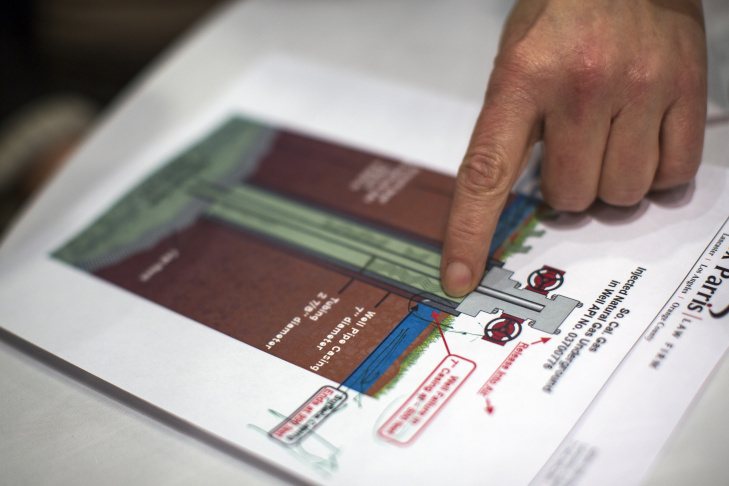 Attorney Robert F. Kennedy Jr. said county and state governments are putting out messages that are reassuring — that the gas leak smells bad but is unlikely to cause long term harm — but he called those misleading. "It's because the government is in cahoots with the oil companies," Kennedy said. 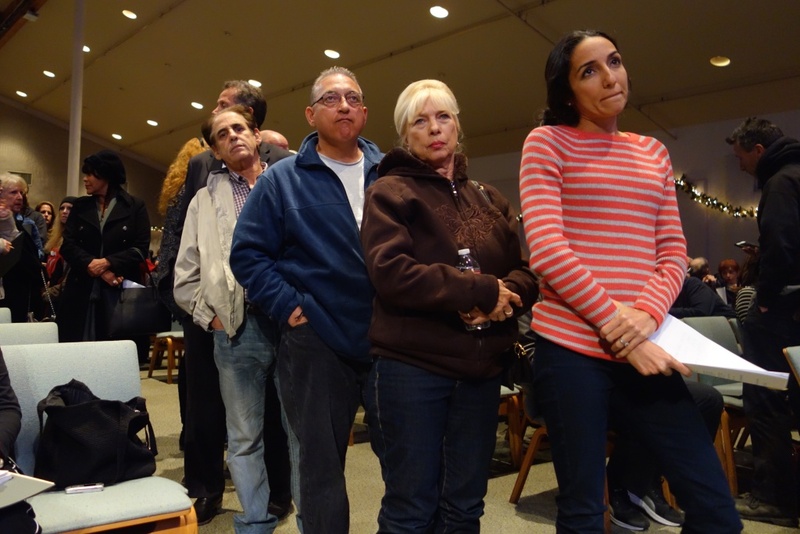 He ticked off the chemicals he said Porter Ranch residents could be breathing. "Benzene and tolulene and xylene and ethyle benzene and all these other contaminants." He said the harm is more than physical, warning residents that home values are falling and that real estate bottom-feeders could soon be snapping up homes. "And it's going to go to the speculators and the vultures who will pick them with the hope that it'll get cleaned up someday," Kennedy said. "All of you have to be reimbursed. And you all ought to get as much money as you can from that reimbursement." In the lobby after the meeting, Henry Missirian, who works in real estate, said he is skeptical about the lawyers, but he said he may have to join one of the lawsuits because the panic alone could crash real estate values. "This is right now a shark tank feeding frenzy for the attorneys and law firms," he said. "This is basically their get rich ticket, this is a multi-billion dollar lawsuit." 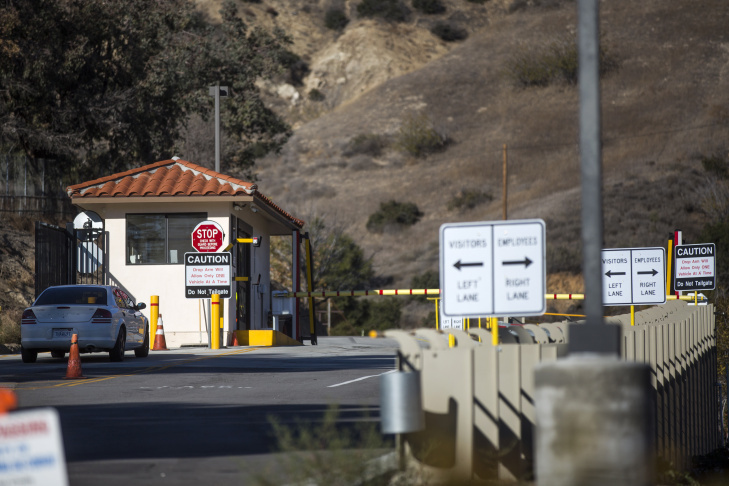 Southern California Gas Co., in a filing with the Security and Exchange Commission, said it had insurance coverage in excess of $1 billion to respond to issues arising from the leak. Even as the gas leak continues to spew into the atmosphere — some 50,000 kilograms an hour — a schism is developing between those who believe they are being physically and financially injured and those who believe what public health experts say — that the smell is bad but doesn't pose any known long term harm. The dividing line crops up in everyday conversations at shopping centers and holiday parties, said resident Sean O'Rourke. "It's like, 'Don't discuss religion or politics or the gas leak at the dinner table'," he said. O'Rourke has a large public profile in the community, which he likens to a small town unlike most of Los Angeles. He's an elected member of the Porter Ranch Neighborhood Council. He sits on the board of his homeowners association, and he is active as a parent at Porter Ranch Community School. 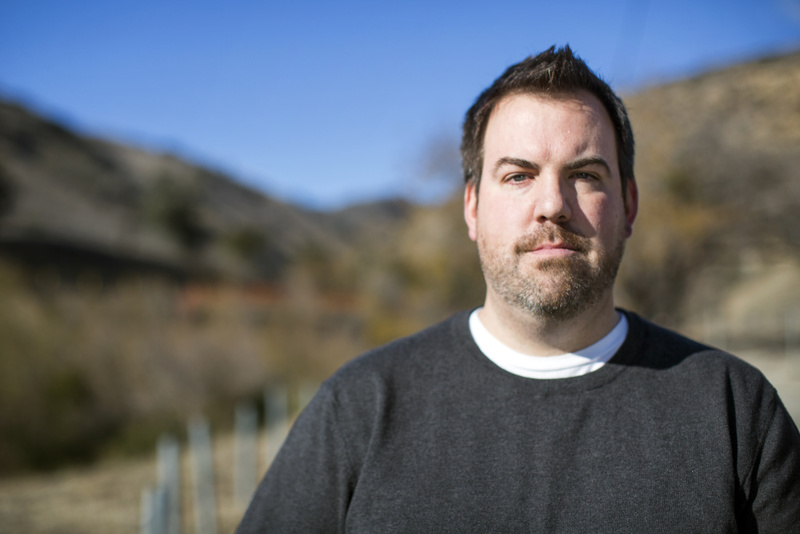 Sean O'Rourke is a Porter Ranch parent and an elected board member of the Porter Ranch Neighborhood Council. 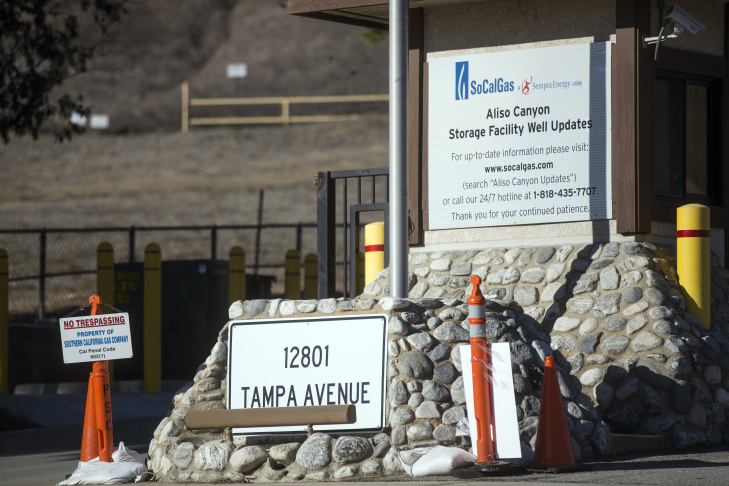 O'Rourke stands outside SoCal Gas' Aliso Canyon Storage Facility on Monday afternoon, Dec. 14, 2015. He was a vocal member of the losing side of a debate over whether to relocate this and one other local school until the leak is stopped. He wanted to keep the school open. He felt confident of his own research into the chemicals coming from the gas leak as well as a Los Angeles County Health Department's letter saying no long term effects were likely. But the Los Angeles Unified School District decided to relocated Porter Ranch Community School and Castlebay Elementary School to campuses outside the immediate area after the winter break. He said the social media backlash has been rough. "There was a Porter Ranch group on Facebook called Porter Ranch Gas Leak," he said, a group that grew to about 900 members. "But after three or four of my opinionated posts, I was banned from the page." O'Rourke said he knows people are getting sick and he doesn't doubt the symptoms are legitimate. However, his family hasn't been affected, so he's not relocating. "A part of me is so hopeful that it will be short term. But I cant' predict what the damage... I think there will be a loss in property values," he said. Driving through Porter Ranch in his electric SUV, he passes by a 1,500-home development that's under construction, and past the site of a new shopping center that is slated to go in next year. He wonders whether the turmoil around the gas leak might scare investors away. "How is that still built with this?" he asked. SoCal Gas Company estimates it will be months before the leak is stopped. 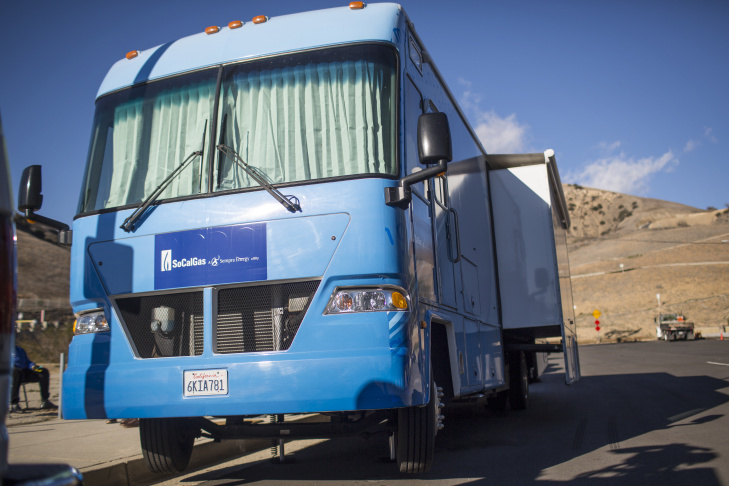 Nobody's predicting when, and how, Porter Ranch will return to normal. 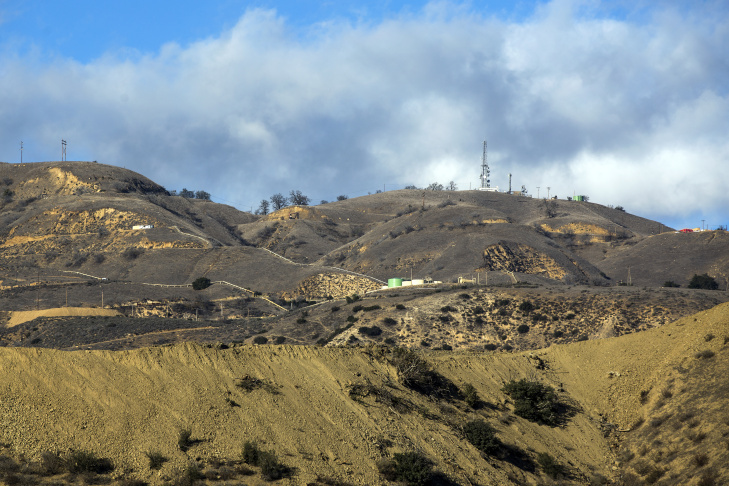 Did Porter Ranch Neighborhood Council official misspend funds?